Glycerin, Aqua and Dipeptide Diaminobutyroyl Benzylamide Diacetate. 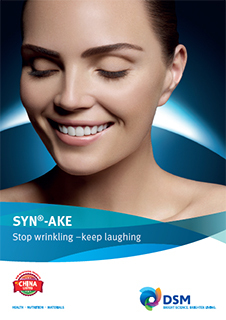 SYN® -AKE by DSM acts as an anti-wrinkle and smoothing agent. It is a small synthetic tri-peptide that helps to reduce the appearance of wrinkles and laughter lines. It is preservative-free, fast acting, long lasting and fully reversible. SYN® -AKE finds application in formulating anti-aging products. It has a shelf life of 48 months.